My little neighborhood has been getting spiffier by the minute. I still remember when I just moved in, my pregnant belly swaying before me, excited to be in the heart of the city (that’s me…the city girl), eager to explore my new home. There were definitely some gems already in place back then, but lately it seems like the gastronomy gods have been smiling down at me. Almost one on top of the other, lovely new places have sprouted, like so many answers to my fervent prayers: my favorite bakery/cafe that is going to be the death of me (they make a mean kimchi fried rice too), the absolute best flat white ever, a fantastic local brick oven pizza place (that makes their own burrata and stracciatella! ), a store selling all kinds of natural and local products, a rustic home store (that I have yet to visit but looks oh-so-promising), an excellent ramen bar (long lines but life changing ramen), a crêperie (because really, who wouldn’t benefit from having crêpes nearby? ), and a couple of other places that look like they would be perfect for a post-work cocktail or two (or three). To add, in the interest of my husband, I’ll also point out that a nice looking bike shop has opened. One of the old standbys though, that has been here before the hoopla of all things hip decided to grace us with their presence, and a place that has seen me through many an emergency, is our neighborhood Korean grocery. It goes by the unassuming name of Kang’s, it’s a bit crowded, and certainly not as swanky as some of the new places here. But oh boy is it ever a treasure trove. Packed to the gills with Korean goodies (as you can imagine a Korean grocery would be) but also all kinds of other things that you (or at least I) find yourself running out off –garlic, canned tomatoes, cereal, ketchup, chicken fillets, pororo crackers. It is also great for when you suddenly realize you’re out of vegetables and need produce in a pinch (like green onions to make the recipe below). They also have gochujang…that Korean chili paste which I have fallen madly in love with. And is used in this. – In the dish where you wish to marinade your beef, place the soy sauce, sugar, sesame oil, garlic, ginger, black pepper, the white parts of the onion, and the gochujang. Whisk well to combine. Add your beef slices to the marinade and turn well to make sure all the beef is coated in the marinade. Let this marinade for 30-45 minutes. – Heat a wok or a large skillet over high heat. When hot add the canola oil. When the oil is hot add the beef, making sure not to crowd the pan. Do this in batches if necessary. Sear the beef on one side and then the other, until just done. Since my beef was sliced so thin this took less than a minute per slice. Repeat until all the beef is done. 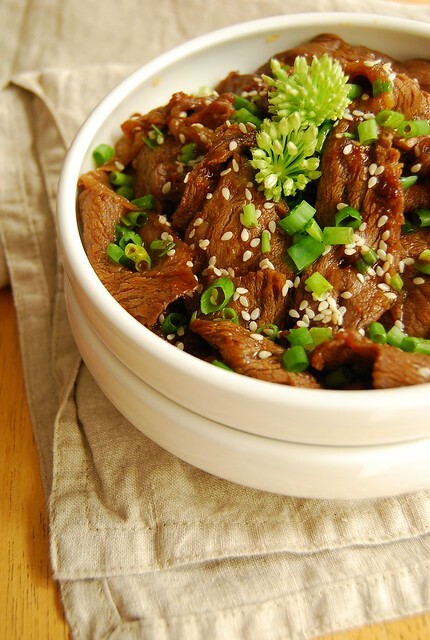 – Pile the beef on a serving place and garnish with toasted sesame seeds and the green parts of the onion. Serve immediately. Gochujang is a Korean chili paste that is made with fermented soybeans and chili (and other such goodies) that has wended its way into my heart ever since the first bulgogi recipe I tried. It is spicy, savory, and pungent, and, although perhaps not as often used as my other Asian ingredients (like soy and fish sauce), still something I like to keep on hand. You can use it in a lot of ways, not the least of it being this dressing, which I can eat with anything. If you’d like to add another dimension to your spicy dishes try it! A tub will keep for quite a bit in the fridge. On the subject of condiments and seasoning…I find I gravitate more towards Korean brand sesame oil versus Chinese brands. The aroma is just so much deeper and nuttier. It’s my own preference so please use your favorite. If you don’t keep sesame oil in your pantry do consider investing in a bottle. It has a fantastic fragrance and is awesome in all kinds of Asian cooking. It gets a lot of use in my kitchen. Aside from a plethora of Asian recipes that call for it, it will turn your regular weeknight veggie stir-fry into something magic. A note on the beef: You can choose to buy beef and slice it yourself as Sommer does. She used New York Strip I believe. I am both lazy and clumsy so I usually buy beef that is already sliced for tepanyaki or karubi, and this works well for me. The original recipe calls for lean steak but I like to make this with beef that has a good marbling. The chances of me buying anything even remotely lean are, well, slim (no pun intended). I like to buy mine at the Kitayama meat shop in Makati. They sell beef from Japanese Wagyu cattle crossbred with local Brahmans, raised in Bukidnon. You get beef that is not as expensive as 100% Wagyu but still has really good marbling. And don’t think they are all about steak – they sell all cuts of beef. Their short ribs are amazing and are what I used in this beef stew. I am pleased as punch with everyone that has been setting up shop in my little corner of the city. I have always tried to be mindful of practicing gratitude and this is something I want to continue and build on this year – and although it may seem like a small and not quite earth-changing detail, I am absolutely grateful for the food fates for sending this abundance my way. A happy new year to you as well Rosa! WOW was so good!! I didn’t have Korean chili paste so I used Thai chili paste. Also marinated it for a few hours.